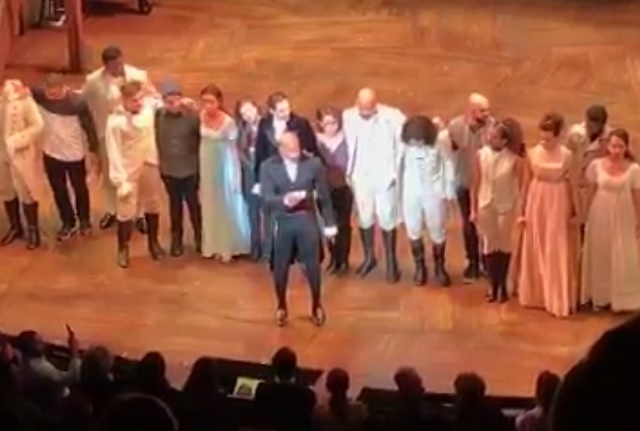 (NaturalNews) By now, you've probably heard about the cast of the Broadway theatrical production "Hamilton" singling out audience member Mike Pence and lecturing him on "inclusiveness" and "tolerance." The "Broadway bullying" violated a pillar of the arts, which is that your audience members are your guests, not your whipping boys or political targets. In lecturing Mike Pence from the stage, in front of all the audience members, the cast of Hamilton treated the theater like a captive hunting preserve where the audience members exist only to be targeted for humiliation or condemnation by the "superiorist" cast, full of arrogance and self-congratulation. This is the same racist theatrical production that announced Whites need not apply for casting calls, because only "colored people" were going to be given the roles anyway. As you might expect, the backlash against the racist, intolerant and "crybully" Hamilton production just keeps growing. Even E Street Band guitarist Steven Van Zandt called for the Hamilton cast to apologize to Mike Pence for violating the safe space of being a theater guest and targeting him from the stage for public condemnation and ridicule. Do these disconnected liberals really have no idea how utterly intolerant, racist and hateful they are? The Hamilton production just demonstrated how crybullies operate: They condemn everyone who disagrees with their delusional political views as "bigoted" while calling themselves "inclusive." Then, from the bully pulpit of "inclusiveness," they target guests who hold political views they don't like, singling them out for public humiliation, all while smugly claiming they alone have a monopoly on "tolerance." The insanity of it all is only making conservatives more steadfast in their opposition to liberal lunacy, by the way, as it's driving home the obvious fact that crybully leftists are the new bigots in America. Yes, the cast of Hamilton is made up of a bunch of racist, intolerant bigots who are so closed-minded, they can't even stand to see a political opponent take a seat and attempt to politely enjoy the arts. No enjoyment of the theater is allowed for you, Vice President Pence, because liberals are too angry to read their lines without flinging some condemnation in your direction just because they lost an election. Note to the left: This is why America rejects you. Your behavior is so delusional and self-contradictory that it borders on mental illness. If you really want to see a racist, intolerant bigot, LOOK IN THE MIRROR. Stop wagging your finger at everyone else when it's YOU who can't tolerate any real diversity at all. In Sunday's Post, Michael Goodwin asked liberals to consider that they might be "ignorant" about the lives of Trump voters -- that they wrongly "swallowed, hook, line and sinker" the "caricature of them the Democratic Party and the national liberal media created." Liberals dominate the national media (and most local media, too) -- as well as Hollywood, Broadway and Silicon Valley. Red America has no choice but to listen to Blue America all the time. And, sorry, it's Blue America that routinely screams "shut up" to voices it doesn't want to hear. That's the essence of political correctness, and not just on campus: Recall, for example, the PC condemnation of the incredibly sensitive and nuanced "red" film, "American Sniper." When you can't understand how your fellow Americans could make "that man" our next president, maybe it's time you stopped assuming it hasn't heard you, and started listening yourselves.